I was watching food network the other night and this was one of the “most favorite things to eat”. This recipe is by Kathleen Stewart of the Downtown Bakery & Creamery in Healdsburg, CA. The recipe appeared in Fine Cooking Magazine, January 2001. These sugar doughnut muffins are baked and then dipped in butter and sugar coated. They must sell these by the millions. This makes a large batch of muffins, but the recipe may be cut in half very easily. * If you find yourself short of buttermilk for your recipe, you can make your own by adding 1 teaspoon of vinegar to 1/4 cup of whole milk. Preheat oven to 350 degrees F. Place rack in middle of the oven. Generously grease and flour muffin tins. NOTE: Also grease the surface between the muffin cups to prevent the muffin tops from sticking to the pan. Using your mixer on medium speed, cream the butter and sugar together until mixture is light and fluffy. Beat in the eggs, one at a time, until fully incorporated into the batter; set aside. In a bowl, sift together the flour, baking powder, baking soda, salt, and nutmeg; set aside. In another bowl, combine the milk and buttermilk; set aside..
Alternately add flour mixture and milk mixture to the egg batter, starting and ending with flour mixture. Mix until all ingredients are fully combined and batter is smooth. Don’t over mix. 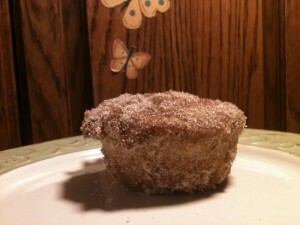 Scoop enough batter into each muffin tin so that the batter is even with the rim of the cup. For regular-size muffin tins, about 1/2 cup – for mini-size muffin tins, about 1 heaping tablespoon. Regular-size Muffin Tins: Bake 30 to 35 minutes until the muffins are firm to the touch. Remove from the oven and let cool just enough to be able to handle. Mini-size Muffin Tins: Bake 12 to 15 minutes until the muffins are firm to the touch. Remove from the oven and let cool just enough to be able to handle. When muffins from cool enough to handle, carefully remove them from the muffin tins, dip them into the melted butter (or brush them all over), and then roll them in the Sugar/Cinnamon mixture. Make-Ahead Directions: Fully bake and cool these muffins without adding the toppings. Store them in a plastic freezer bag in the freezer for up to 1 month. To serve, thaw muffins to room temperature before applying the toppings. Makes 24 medium-size muffins or 52 mini-muffins. 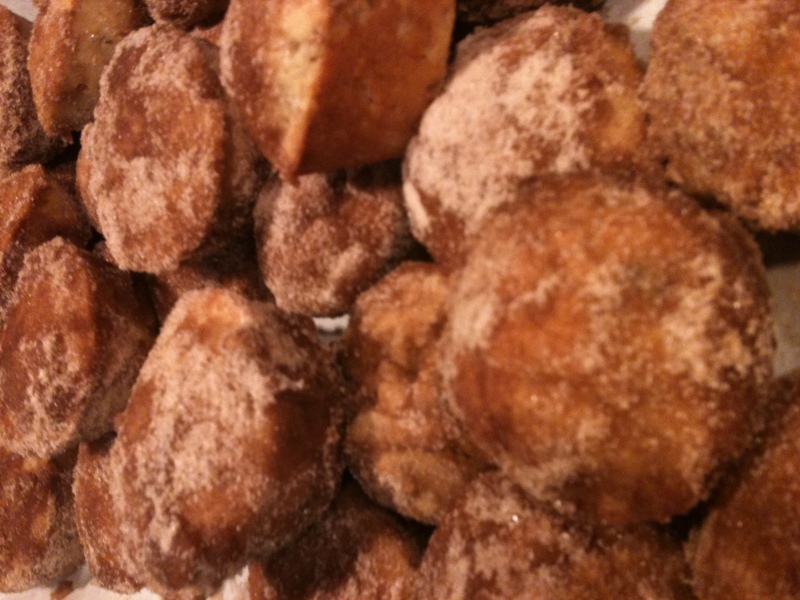 Powdered (confectioner’s) Sugar – Omit dunking the muffins in melted butter. 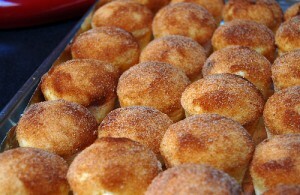 Instead roll them in 1 cup sifted powdered sugar. 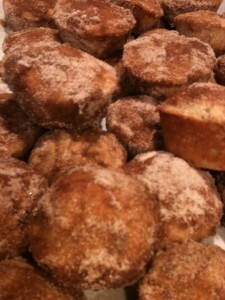 This entry was posted in Fan Favorites, My Bakery and tagged black walnut, cinnamon, donut, muffin, sugar. Bookmark the permalink.